The very first batch of Keto Cinnamon Rolls I made was a total fail. If you follow me on Instagram you have probably seen how bad looking they turned out. The original recipe calls for two tablespoons of cream cheese and as at the time I didn’t have any, I decided to add two tablespoons of heavy whipping cream because why not… They turned out so flat, like cookies. The taste was pretty good but they didn’t look like breakfast cinnamon rolls. With a few adjustments, I came up with a recipe that’s super tasty and low in carbs. Went shopping and got cream cheese. The second batch was a success. I added sweetener and cinnamon powder in the dough too. I usually make only super easy keto desserts like recipes like mug cakes or keto fudges. 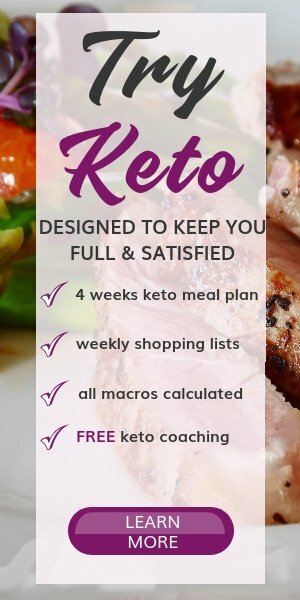 But, I investested some time and passion into the keto rolls and I am amazed by the result. Don’t be shocked that the dough is made out of mozzarella cheese because you definitely can’t feel it. 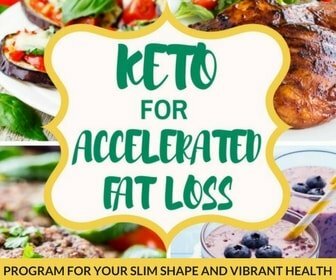 Mozzarella has a neutral taste so you can make sweet keto treats with it and have no problem. I put the keto cinnamon rolls to a test and asked my non-keto family members to guess the ingredients in this keto dessert. They said that they can definitely taste the cinnamon, almond flour and butter. And that’s it. No trace of mozzarella. They were so surprised when I told them that the keto cinnamon rolls were made out of mozzarella dough. How to make the keto cinnamon rolls dough out of mozzarella? There are two ways you can make the dough. In a bowl mix the mozzarella cheese and the cream cheese. Microwave for 30-40 seconds or until the cheese starts to melt. 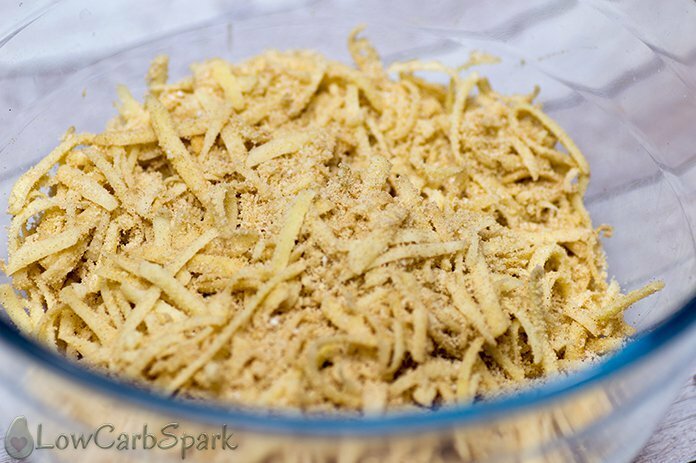 Incorporate well the almond flour, the beaten egg, the sweetener, the cinnamon powder and the baking powder in the cheese mixture. For me, this method is a little bit difficult because I’m not quite sure how well all the ingredients will mix in the melted cheese. I used this method with the first round of the keto rolls. It might be one of the reasons why I didn’t get fluffy keto cinnamon rolls. 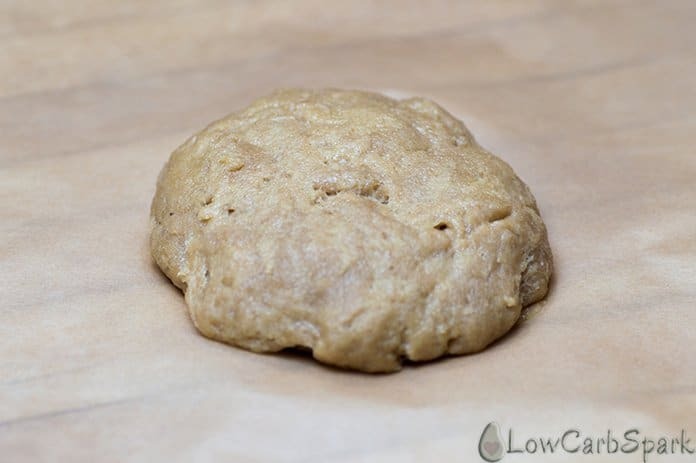 This is the method I used in this recipe and I started with by mixing the mozzarella with the almond flour, the cinnamon powder the sweetener, and the baking powder. This is how it looks before using the microwave. This way I am sure that the almond flour and the rest of the ingredients are well mixed with the cheese. Add the whisked egg and mix the dough until it comes together in a solid ball. 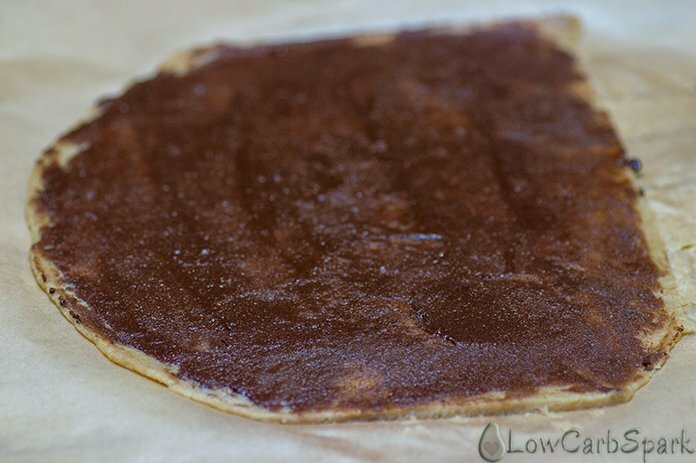 If it’s too sticky you can sprinkle some almond flour, so it can be handled well. Easily begin to roll from side to side into one long roll. Out of the oven, the hot keto cinnamon rolls look fantastic. 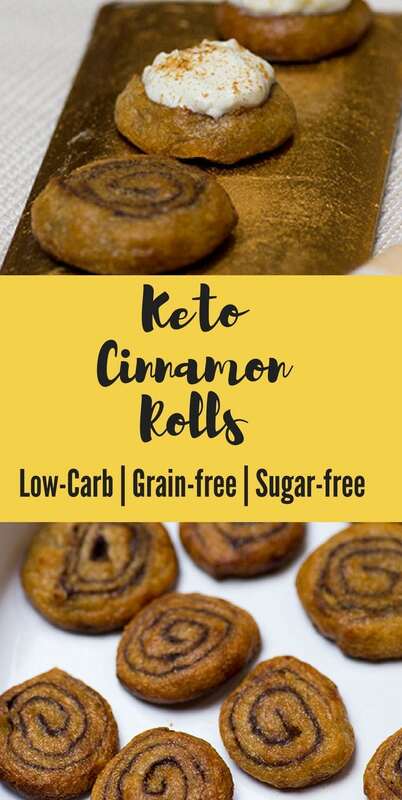 Remember that this keto cinnamon recipe is wheat-free, dairy, gluten and sugar-free. If you are a vegetarian make sure you include this dessert in your vegetarian keto meal plan. 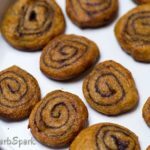 Keto cinnamon rolls require a little more work and ingredients but the result is absolutely amazing. The whole house smells fantastic and no one will ever know that the keto cinnamon rolls are made with cheese dough. Combine the mozzarella, cream cheese, almond flour, cinnamon, baking powder and sweetener until the shredded cheese is well covered. Microwave the cheese mix for 40-50 seconds or until the cheese has melted. 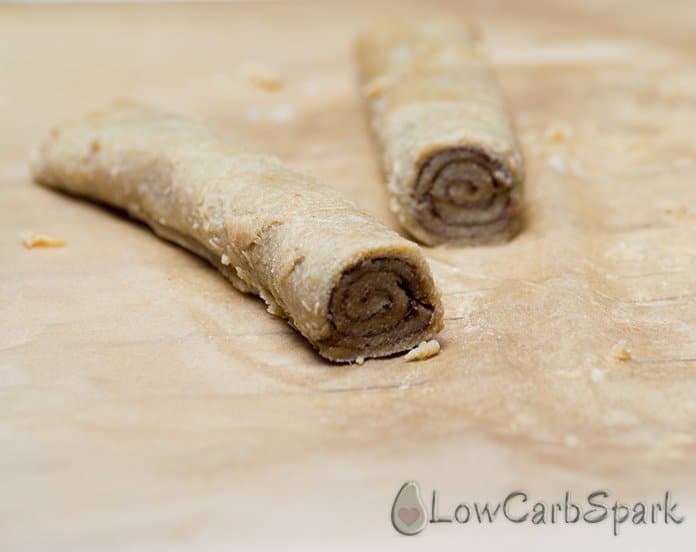 Using a rolling pin roll the dough into a long rectangle. Mix the ingredients for the filling in a small bowl. Spread the filling over the rolled cheese dough. 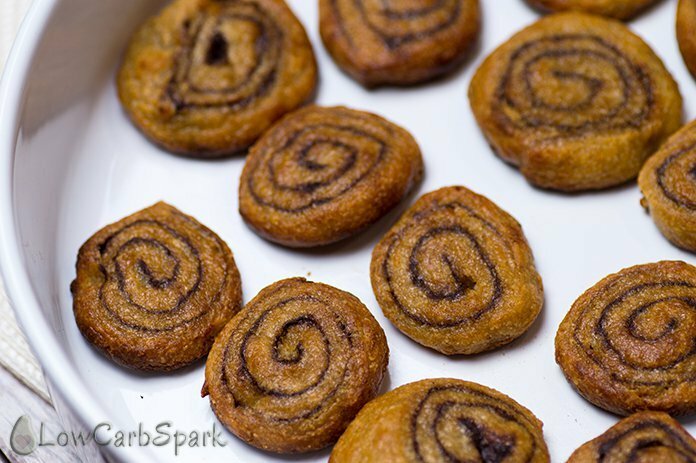 Using a sharp knife cut into 1/2 inch long cinnamon rolls and place them on a baking tray. Let them cook for about 10-15 minutes or until they start to brown. While the keto cinnamon rolls are baking, prepare the frosting. Combine the frosting ingredients in a bowl until the mixture is creamy and smooth. After you get the rolls out of the oven spread the frosting over the rolls and enjoy! Is THERE any differencE in the sugar Free sweeteners for using in different recipes? I see monk fruit used in a lot of RECIPEs. 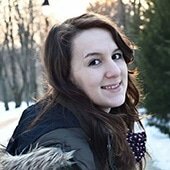 I am trying to be sugar free this year and I am confused at which sweeteners are the best. Monk fruit sweetener is a good option in a low carb diet. It’s also the best tasting one, but it’s a little more expensive than the others. One quesion tho, if I use coconut flour, shloud I add maybe two more eggs? Yes, that should work and you can use less coconut flour as it is way more absorbent than almond flour. Just play with the ingredients until you get the right dough consistency!